I have a cascading select with 2nd dropdown appears based on the first dropdown selection. An extra blank option appears which is not part of intended behaviour of the dropdown. 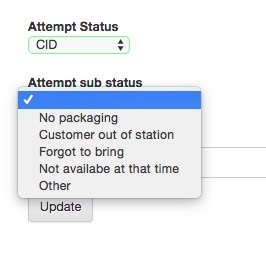 <select ng-init="order.attempt_status_sub = order.attempt_status_sub || subStatuses.name"
How do I avoid empty extra select from appearing in dropdown? I am assuming you are setting this for an asynchronously bound data. ng-init is really bad for this purpose. Thumb rule is do not use ng-init for something which controller is supposed to do. You should set up your view model in the controller. The reason why it could fail when the data is bound asynchronously is because ng-init'ed expression is not watched. So it just runs once during the first rendering and the subStatuses is not yet populated and it falls back to showing the default empty option. And even if the data is populated and view is updated during the later digest cycle ng-init expression does not run again. So just initialize it in your controller, instead of using ng-init. How do I ignore the initial load when watching model changes in AngularJS?